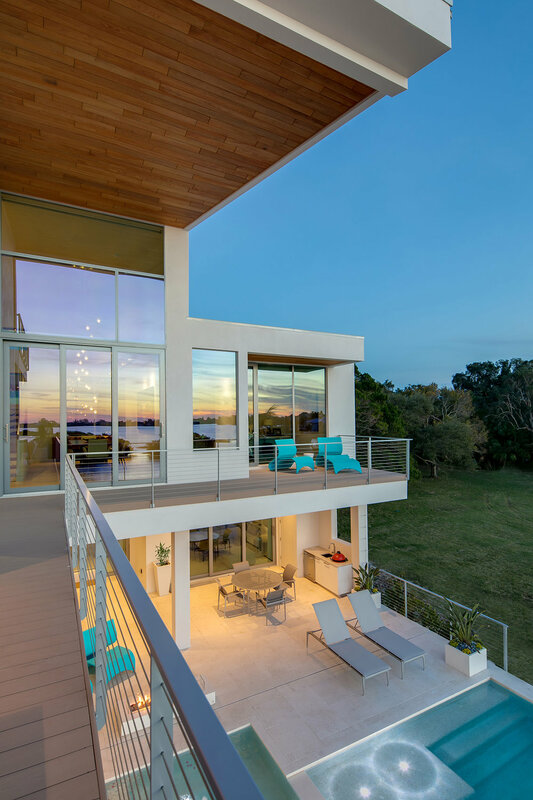 Situated on a narrow lot within a flood zone on Sarasota Bay, the property had challenges to overcome including constructing this project within 10 feet from an adjacent residence. In order to define sightlines away from the neighboring property and to take advantage of the open water views from the project site, the Architect proposed an upside down house design, lifting social areas to the upper levels and locating guest rooms and children’s rooms on the ground floor, alongside an informal family area. Above that foundation the upper main living level includes the master bedroom, an open kitchen area adjacent to the main staircase, and the dining and living spaces. On this property the views continually improve the higher you move upwards until culminating with an upper level social space with exterior deck. The Owner and the Architect discussed “building the house of the future today” and a large part of this goal was to create a home that reduced dependency on the power grid with a focus on nature and passive systems. 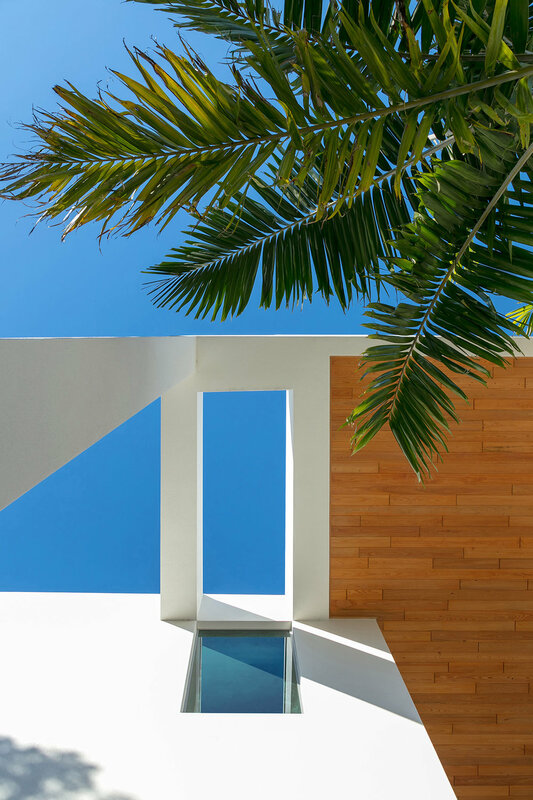 The use of large overhangs to shade the façade to reduce heat gain, high clerestory windows to provide natural daylight and to limit the need to utilize indoor lighting are constant design themes defining the elements of the house. The layout also allows for easy access to the exterior on all levels allowing for natural ventilation. 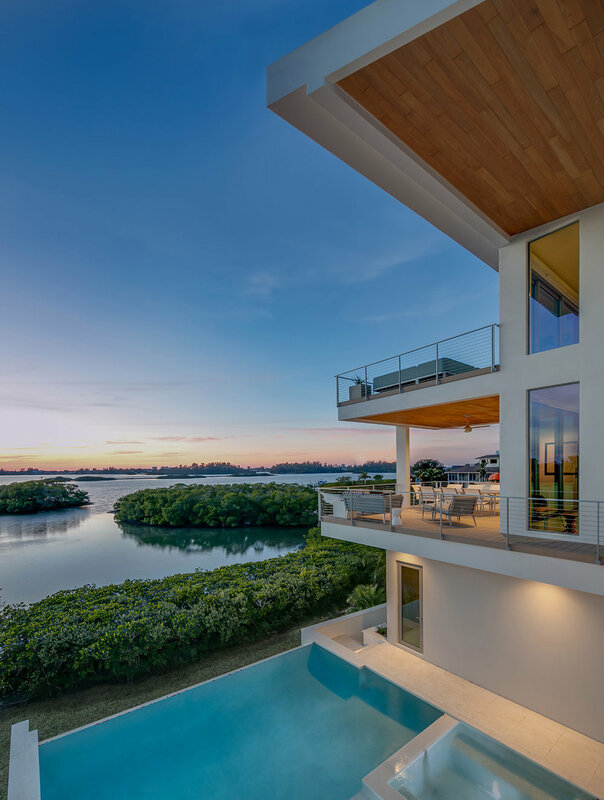 The project is one of the highest rated sustainable houses constructed in the United States with a HERS Index of -26, which is the third lowest HERS score ever recorded in Florida. Third party performance testing includes LEED Platinum Certification, Florida Green Building Coalition (FGBC) Platinum Certification, EPA Energy Star Highest Standards Certified, Indoor air PLUS Certified, and DOE Zero Energy Ready Home Certified.